I posted about the Keys to Good Cooking preview a couple of months ago and was excited to get my hands on my own copy of the book. I started out like a dutiful student, reading from the beginning. Eventually, I felt like I was learning so much about things like appliances and tools, cooking methods and produce, that is was time to skip to my favorite chapter- Cakes, Muffins, and Cookies. Here's a few things I learned from right away- "Cracked or peaked cakes result from overmixing batter or too high an oven temperature, so the center continues to expand after the surface has set. Try a lower temperature and/or shorter mixing." I've definitely had peaked cakes before, so I'm going to try to remember this next time I make a cake! In the section on muffins, it talks about mixing muffins as quickly as possible to avoid "losing leavening gas". I've known not to overbeat but I thought that referred to strokes, not necessarily time. For me, this is another push to bake "mise en place", or with all the ingredients out and ready to go before you start. I know that when I have everything ready and carefully read the recipe first (as opposed to reading it as I go, with a baby on my hip while I'm on the phone) I get much better results! Also on muffins, he says the secret to a "shapely peak" (super necessary for aesthetics since you can't "build" one out of frosting or it's no muffin) is to "make sure the batter isn't over-leavened, fill the pan cups almost full, and use a relatively high baking temperature, 400 to 425." 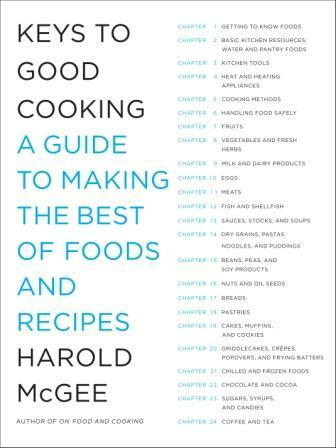 This wonderful book is also full of common sense tips that often make the biggest difference, like remembering to check doneness early and to allow things to start to cool and firm before removing them from the pan. Probably my favorite page so far is 439, where he says "Cookie recipes often need adjustment" and goes on to describe what to add or adjust to get the perfectly crisp/soft/tender/dark/moist cookie you're looking for. You can bet that page in my book is going to be covering flour and butter in no time! There's a certainly a lot of info in here that I put into my "that's nice, hopefully I'll remember that in a couple years when I make my next turkey" or something like that. However, all the information is super accessible- the chapters are listed on the covers! The formatting is beautiful and easy to skim when you need to find just what you are looking for. The information is sorted logically and accessibly. I'm sure you have a few things that you are really great at making- along with a few things that are a little more daunting. While I feel very comfortable baking cookies or pies, I get a little more nervous with fancy cakes or caramel. I'll be the first to admit that I don't know the tricks to cooking everything, but with Keys to Good Cooking, I can find the tips to make my attempts successes. And since I know I have a great source to turn too, I'm not quite as worried about trying new things when the opportunity arises. Oh man, this looks like a necessary read. I'll have to stop by Barnes and Noble this week! I never knew that about mixing muffins. I thought it referred to number of strokes too and developing too much gluten. Totally makes sense though wanting to not lose the leavening properties! I can't wait for the Halloween muffins tomorrow! Thank you, as always, for visiting. These are great tips! I'll have to check it out! Thanks for sharing! I'm so glad that you found the book helpful - thanks for being a part of the tour. And how handy to have the chapters right on the cover! It definitely makes things easy to find in a hurry. I'll be adding this to my kitchen shelf as soon as I can get my hands on a copy. oooh i definitely need this book. i already have his other book but more cooking books never hurts!